Knowledge! Hi, I'm Ron Hall. I have a vast knowledge of the film industry and can find movie memorabilia that you won't find anywhere else! Experience! I've been in business for over 30 years! I know public domain films inside and out. You can put my experience to work for you right now! Customer Service! We are a caring company, absolutely committed to serving our customers well. You won't get service like this anywhere else! Questions Answered! 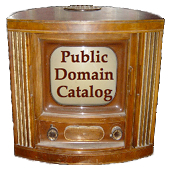 Please ask questions about any phase of public domain. Yes, you can show PD films in public, advertise and charge admission! 16mm Films. I started by collecting 16mm films and still have a fondness for sprocket holes and film cement. I may be able to evaluate your 16mm collection. Matinee at the Bijou. I have been helping the Chudwig group bring back the original PBS episodes of Matinee at the Bijou on DVD, and also seeking a TV network to finance and air new episodes in High Definition. Anyone who wants to help, please contact me! My Movie Past. To learn more about my past and present interests in vintage films, please visit the Cafe Roxy Blog. Tarzan Escapes! When I was eight-years-old I saw Tarzan battle giant vampire bats in Tarzan Escapes. No one else (apparently) has ever seen this lost horror sequence. Read more about it at I Saw the Giant Vampire Bats!